Optical polarization imaging has played an important role in many biological and biomedical applications, as it provides a label-free and non-invasive detection scheme to reveal the polarization information of optical rotation, birefringence, and photoelasticity distribution inherent in biological samples. However, the imaging speeds of the previously demonstrated polarization imaging techniques were often limited by the slow frame rates of the arrayed imaging detectors, which usually run at frame rates of several hundred hertz. By combining the optical coherent detection of orthogonal polarizations and the optical time-stretch imaging technique, we achieved ultrafast polarization bio-imaging at an extremely fast record line scanning rate up to 100 MHz without averaging. We experimentally demonstrated the superior performance of our method by imaging three slices of different kinds of biological samples with the retrieved Jones matrix and polarization-sensitive information including birefringence and diattenuation. The proposed system in this paper may find potential applications for ultrafast polarization dynamics in living samples or some other advanced biomedical research. S. G. Demos and R. R. Alfano, “Optical polarization imaging,” Appl. Opt. 36(1), 150–155 (1997). 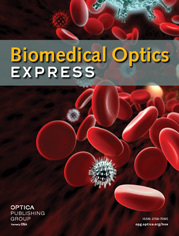 L. Wang and H. I. Wu, Biomedical Optics: Principles and Imaging (John Wiley & Sons, 2012), Chap. 1. N. Ghosh and I. A. Vitkin, “Tissue polarimetry: concepts, challenges, applications, and outlook,” J. Biomed. Opt. 16(11), 110801 (2011). V. V. Tuchin, L. V. Wang, and D. A. Zimnyakov, Optical Polarization in Biomedical Applications (Springer Science & Business Media, 2006). J. C. Low, T. J. Ober, G. H. McKinley, and K. M. Stankovic, “Quantitative polarized light microscopy of human cochlear sections,” Biomed. Opt. Express 6(2), 599–606 (2015). A. M. Vrabioiu and T. J. Mitchison, “Structural insights into yeast septin organization from polarized fluorescence microscopy,” Nature 443(7110), 466–469 (2006). Y. Kim, J. Jeong, J. Jang, M. W. Kim, and Y. Park, “Polarization holographic microscopy for extracting spatio-temporally resolved Jones matrix,” Opt. Express 20(9), 9948–9955 (2012). M. Sun, H. He, N. Zeng, E. Du, Y. Guo, S. Liu, J. Wu, Y. He, and H. Ma, “Characterizing the microstructures of biological tissues using Mueller matrix and transformed polarization parameters,” Biomed. Opt. Express 5(12), 4223–4234 (2014). J. J. Pasquesi, S. C. Schlachter, M. D. Boppart, E. Chaney, S. J. Kaufman, and S. A. Boppart, “In vivo detection of exercised-induced ultrastructural changes in genetically-altered murine skeletal muscle using polarization-sensitive optical coherence tomography,” Opt. Express 14(4), 1547–1556 (2006). J. N. Forkey, M. E. Quinlan, and Y. E. Goldman, “Protein structural dynamics by single-molecule fluorescence polarization,” Prog. Biophys. Mol. Biol. 74(1-2), 1–35 (2000). C. T. Anderson, A. Carroll, L. Akhmetova, and C. Somerville, “Real-time imaging of cellulose reorientation during cell wall expansion in Arabidopsis roots,” Plant Physiol. 152(2), 787–796 (2010). T. Tani, M. Shribak, and R. Oldenbourg, “Living cells and dynamic molecules observed with the polarized light microscope: the legacy of Shinya Inoue,” Biol. Bull. 231(1), 85–95 (2016). D. Litwiller, “Ccd vs. cmos,” Photon. Spectra 35(1), 154–158 (2001). K. Goda, K. K. Tsia, and B. Jalali, “Serial time-encoded amplified imaging for real-time observation of fast dynamic phenomena,” Nature 458(7242), 1145–1149 (2009). A. K. Lau, T. T. Wong, K. K. Ho, M. T. Tang, A. C. Chan, X. Wei, E. Y. Lam, H. C. Shum, K. K. Wong, and K. K. Tsia, “Interferometric time-stretch microscopy for ultrafast quantitative cellular and tissue imaging at 1 μm,” J. Biomed. Opt. 19(7), 76001 (2014). A. K. Lau, H. C. Shum, K. K. Wong, and K. K. Tsia, “Optofluidic time-stretch imaging - an emerging tool for high-throughput imaging flow cytometry,” Lab Chip 16(10), 1743–1756 (2016). H. Kobayashi, C. Lei, Y. Wu, A. Mao, Y. Jiang, B. Guo, Y. Ozeki, and K. Goda, “Label-free detection of cellular drug responses by high-throughput bright-field imaging and machine learning,” Sci. Rep. 7(1), 12454 (2017). A. H. Tang, P. Yeung, G. C. Chan, B. P. Chan, K. K. Wong, and K. K. Tsia, “Time-stretch microscopy on a DVD for high-throughput imaging cell-based assay,” Biomed. Opt. Express 8(2), 640–652 (2017). T. Y. Li, A. E. Willner, and I. Kaminow, Optical Fiber Telecommunications VB: Systems and Networks (Elsevier, 2010), Chap. 3. T. D. Yang, K. Park, Y. G. Kang, K. J. Lee, B. M. Kim, and Y. Choi, “Single-shot digital holographic microscopy for quantifying a spatially-resolved Jones matrix of biological specimens,” Opt. Express 24(25), 29302–29311 (2016). D. G. Anderson and R. Barakat, “Necessary and sufficient conditions for a Mueller matrix to be derivable from a Jones matrix,” J. Opt. Soc. Am. A 11(8), 2305–2319 (1994). Y.-H. Feng, X. Lu, L. Song, X. Guo, Y. Wang, L. Zhu, Q. Sui, J. Li, K. Shi, and Z. Li, “Optical digital coherent detection technology enabled flexible and ultra-fast quantitative phase imaging,” Opt. Express 24(15), 17159–17167 (2016). K. K. Tsia, K. Goda, D. Capewell, and B. Jalali, “Performance of serial time-encoded amplified microscope,” Opt. Express 18(10), 10016–10028 (2010). N. Vansteenkiste, P. Vignolo, and A. Aspect, “Optical reversibility theorems for polarization: application to remote control of polarization,” J. Opt. Soc. Am. A 10(10), 2240–2245 (1993). B. H. Park, M. C. Pierce, B. Cense, and J. F. de Boer, “Jones matrix analysis for a polarization-sensitive optical coherence tomography system using fiber-optic components,” Opt. Lett. 29(21), 2512–2514 (2004). E. Ip, A. P. T. Lau, D. J. Barros, and J. M. Kahn, “Coherent detection in optical fiber systems,” Opt. Express 16(2), 753–791 (2008). M. Yamanari, S. Makita, V. D. Madjarova, T. Yatagai, and Y. Yasuno, “Fiber-based polarization-sensitive Fourier domain optical coherence tomography using B-scan-oriented polarization modulation method,” Opt. Express 14(14), 6502–6515 (2006). S. Jiao and L. V. Wang, “Jones-matrix imaging of biological tissues with quadruple-channel optical coherence tomography,” J. Biomed. Opt. 7(3), 350–358 (2002). S.-Y. Lu and R. A. Chipman, “Homogeneous and inhomogeneous Jones matrices,” J. Opt. Soc. Am. A 11(2), 766–773 (1994). U. P. Agarwal, “Raman imaging to investigate ultrastructure and composition of plant cell walls: distribution of lignin and cellulose in black spruce wood (Picea mariana),” Planta 224(5), 1141–1153 (2006). N. Kemp, H. Zaatari, J. Park, H. G. Rylander Iii, and T. Milner, “Form-biattenuance in fibrous tissues measured with polarization-sensitive optical coherence tomography (PS-OCT),” Opt. Express 13(12), 4611–4628 (2005). G. F. Leedale, B. J. D. Meeuse, and E. G. Pringsheim, “Structure and physiology of Euglena spirogyra. I and II,” Arch. Microbiol. 50(1), 68–102 (1965). C. He, H. He, J. Chang, Y. Dong, S. Liu, N. Zeng, Y. He, and H. Ma, “Characterizing microstructures of cancerous tissues using multispectral transformed Mueller matrix polarization parameters,” Biomed. Opt. Express 6(8), 2934–2945 (2015). X. R. Huang and R. W. Knighton, “Diattenuation and polarization preservation of retinal nerve fiber layer reflectance,” Appl. Opt. 42(28), 5737–5743 (2003). M. Menzel, J. Reckfort, D. Weigand, H. Köse, K. Amunts, and M. Axer, “Diattenuation of brain tissue and its impact on 3D polarized light imaging,” Biomed. Opt. Express 8(7), 3163–3197 (2017). Fig. 1 (a) Schematic setup of our ultrafast polarization imaging system. (b) Schematic diagram of the optical coherent receiver. (c) Step-by-step illustrations of the polarization-division multiplexing. MLL: mode-locked laser; BPF: band pass filter; DCF: dispersion compensating fiber; EDFA: erbium-doped fiber amplifier; PC: polarization controller; PMOC: polarization maintaining optical coupler; PBC: polarization beam combiner; OC: optical circulator; VODL: variable optical delay line; Col: collimator; QWP: quarter wave plate; L1, L2: objective lenses; all the orange-colored components are polarization maintaining (PM) fiber devices. Fig. 2 Images of a standard birefringence target. (a) Image of birefringence captured by the conventional polarizing microscopy. (b) Image of Phase retardation. (c) Image of Diattenuation. (d) Image of Mueller matrix element (M11). (e), (f), (g), (h) Relative amplitude images of the Jones matrix elements (J11 – J22). (i) Actual image of the birefringence resolution target. Images (d)-(f) share a same color bar All images above have the same dimensions of 400 × 500 µm. Scale bar: 100 µm. Fig. 3 Images of a plant stem cross cut slice. (a) Image of birefringence captured by the orthogonal polarizing microscopy. (b) Bright field (BF) image captured by the conventional optical microscopy. (c) Relative amplitude of the Jones matrix elements (J11 – J22). (d) Image of Mueller matrix element (M11). (e) Image of Phase retardation. (f) Image of Diattenuation. All images captured by our system above have the same dimensions of 50 × 500 µm. Scale bar: 10 µm. Fig. 4 Images of a spirogyra conjugation slice. (a) Image of birefringence captured by orthogonal polarizing microscopy. (b) Bright field (BF) Image captured by conventional optical microscopy. (c) Images of the relative amplitude of Jones matrix elements (J11-J22). (d) Image of Mueller matrix element (M11). (e) Image of phase retardation. (f) Image of diattenuation. All images captured by our system above have the same dimensions of 50 × 500 µm. Scale bar: 10 µm. Fig. 5 Images of a human skin basal cell carcinoma slice. (a) Image of birefringence captured by orthogonal polarizing microscopy. (b) Bright field (BF) Image captured by conventional optical microscopy. (c) Images of the relative amplitude of Jones matrix elements (J11-J22). (d) Image of Mueller matrix element (M11). (e) Image of phase retardation. (f) Image of diattenuation. All images captured by our system above have the same dimensions of 50 × 500 µm. Scale bar: 10 µm.